Ford unveiled a host of new tech features today that will be standard on all of its models by 2020. They’re calling the whole thing Ford Co-Pilot360. The important base set of features lets the car brake for you in emergencies and keep you in your lane. But that co-pilot name implies much, much more. Sadly, Ford Co-Pilot360, as currently constituted, isn’t a particularly good co-pilot. That lane-keeping system is the critical piece of the Co-Pilot360 system. It can “steer back toward the center of the lane,” vibrate the steering wheel if you get too close to lane markers, and monitor driving patterns that might indicate whether a driver is fully alert or not. Ford’s system is reliant on a bunch of cameras and radar. What the base package doesn’t include though—adaptive cruise control, post-collison braking, and evasive steering assist—are features that would let it live up to its name. These are what make a system like Tesla’s Autopilot or Cadillac’s Supercruise feel genuinely next-generation. Ford says they’ll offer those features, but only if customers pay more, referring to them in a press release as “premium driver-assist technologies.” Should customers opt to go for them, Ford’s system will be more or less in line with what Tesla customers get with Tesla AutoPilot. But it’s also a signal that Ford’s efforts to compete in that space are much less aggressive than other competitors like GM, though more ambitious than Fiat Chrysler. Ford at least trumpets this as “the most advanced suite of standard driver-assist technologies among full-line brands,” whatever that means. 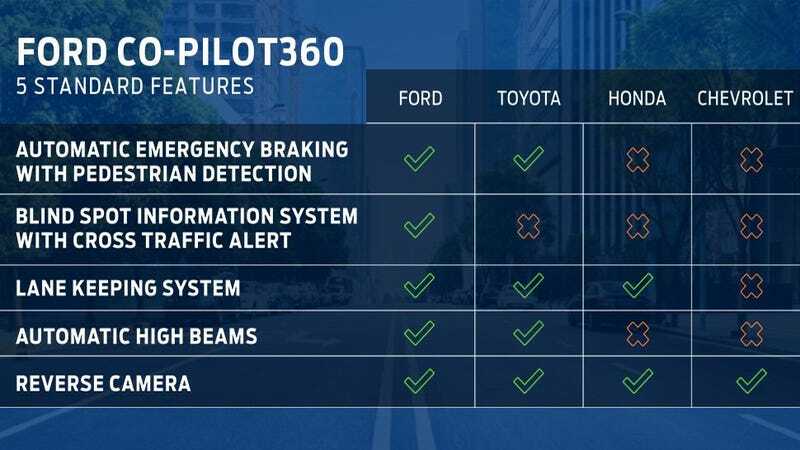 It’s weird to see Ford, which talks a big talk about moving into self-driving cars, to hedge things on its standard features and leave the best stuff for the options list. Ford’s one of the biggest car companies in the world. It could make a splash here! But it hasn’t.